Fluoridation Controversy - fluoride in water is good for kids. So why are these towns banning it? 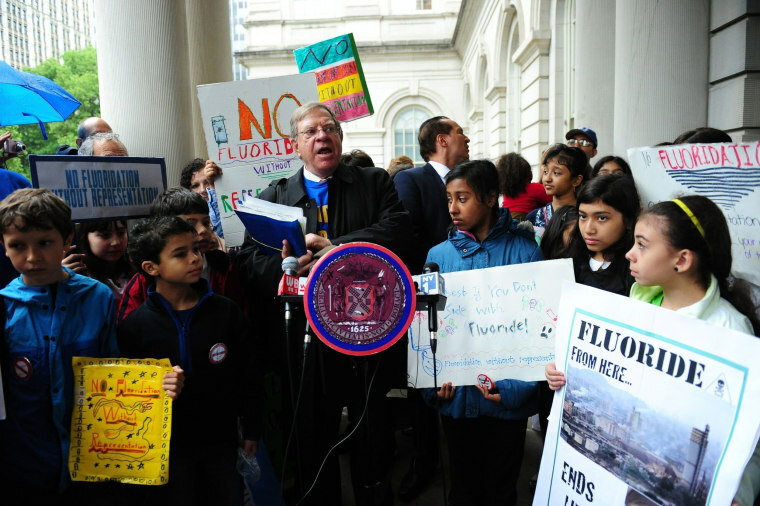 Fluoridation Controversy – fluoride in water is good for kids. So why are these towns banning it? “Anti-fluoridationists” claim, without scientific evidence, that fluoride lowers IQ and causes everything from Alzheimer’s to cancer. They spread the word on Facebook groups, like that of the New York State Coalition Opposed to Fluoridation, which blames fluoride for problems including thyroid damage and was slammed in 2012 for falsely claiming that the federal government “recommends avoiding fluoridated water when making infant formula.” (The CDC says it’s fineto use fluoridated tap water for formula, though the agency notes it may cause mild spotting on babies’ teeth, so parents can use low-fluoride bottled water some of the time instead.) Reddit users claim fluoride kills gut bacteria. And on Twitter, fluoride is regularly called a cancer-causing neurotoxin. The anti-fluoride movement has also made headway offline. In June, the Texas Republican Party opposed water fluoridation in its 2018 platform. In New Jersey, where more than 80 percent of residents do not have fluoridated water, the town of East Brunswick stopped fluoridating three years ago after Mayor David Stahl called it “mass medication of the public,” a familiar refrain on anti-fluoridation forums. In Brooksville, Florida, a city of 8,000 about an hour north of Tampa, Mayor Betty Erhard has said for years that fluoride is a toxin and a waste of taxpayer money. Next month, at her urging, Brooksville will vote on removing it. “I believe that people should consent to what’s in their water,” Erhard said. Some townspeople agree. “Fluoride is a dangerous cancer-causing agent. I don’t even like taking a shower in it,” one wrote on Erhard’s Facebook page. The first place in America to receive fluoridated water was Grand Rapids, Michigan, in 1945, when residents there became guinea pigs for the theory that boosting existing natural fluoride levels in water would decrease tooth decay, particularly in children. The experiment, by the United States Public Health Service, was done without residents’ consent — still a point of contention among anti-fluoridationists. The experiment was so successful that 11 years into what was supposed to be a 15-year study, researchers announced the rate of cavities among Grand Rapids’ 30,000 schoolchildren had dropped by 60 percent. But not everyone was pleased. Since then, the conspiracy theories have evolved from fears of a communist plot to other worries about purported dangers of fluoride — an abundant element that occurs naturally in water, even when it’s not added by the government. To experts, objecting to fluoride is nonsensical. The compound, consumed in water or applied topically through toothpaste or mouthwash, prevents cavities by replacing weakened structures in the teeth, said Dr. Kerry Maguire, associate clinical investigator of Forsyth, an independent research institute specializing in oral health. It’s true that too much fluoride can be dangerous — one complication is skeletal fluorosis, which causes stiffening and pain of the joints and bones or abdominal pain, nausea and vomiting — but those effects only occur with prolonged exposure to a far higher level of fluoride than is found in public water systems in the U.S., experts say. In this country, the only common side effect of fluoridation is fluorosis of the teeth — minor staining that is often only visible to a dentist. Today, nearly 75 percent of the U.S. receives fluoridated water from community water systems. That’s a number that Paul Connett, a chemistry professor emeritus at St. Lawrence University in Canton, New York, hopes to get down to zero. “There’s umpteen ways that fluoride can cause damage,” said Connett, executive director of the nonprofit Fluoride Action Network, which aims to end fluoridation worldwide. Connett was initially skeptical of concerns about fluoride when his wife asked him two decades ago about its health effects. “The prevailing attitude is that people who are opposed to fluoride are crazy, so I didn’t want to be stigmatized in that way,” Connett said. But the more he looked into it, the more convinced Connett became that fluoride was indeed toxic. He now cites what he bills as a “dynamite” 2017 study that concluded that higher prenatal fluoride exposure was associated with lower cognitive outcomes in children in Mexico. The findings, he says, are consistent with more than 50 other studies that concluded that fluoride lowers IQ. But many dental experts dismiss such studies as bogus, particularly because many of them were done in other countries, where natural fluoride levels are far higher than in the U.S. and there may be other factors, like polluted water. 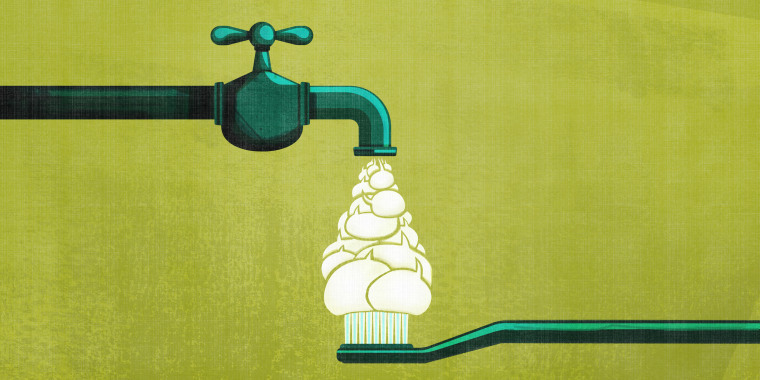 Some anti-fluoridationists oppose all fluoride, including in toothpaste. (Sales of fluoride-free toothpastes are relatively small but projected to grow; an article in the dental journal Gerodontology in August found that such toothpastes have “no impact” on preventing cavities.) Fluoride opponents seize on the warning label on toothpaste cautioning that a poison control center should be called if a child accidentally ingests too much, saying that proves fluoride is a toxin. The American Dental Association, which has supported water fluoridation since 1950, disputes that, pointing out that the amount of fluoride in an entire tube of toothpaste wouldn’t be fatal, but other additives would likely cause a child to vomit. The Fluoride Action Network disagrees. The group sued the Environmental Protection Agency in federal court in San Francisco last April to stop water fluoridation. “Which is more important: protecting your children’s brain, or protecting your children’s teeth?” Connett said. He expects the case to be heard next August. The EPA said it does not comment on pending litigation. Kentucky is the only state to require fluoridation in every community water system that serves 1,500 or more people, and as a result, 99.99 percent of residents receive fluoridated water. Anti-fluoridationists have tried to reverse the law, but it’s not going anywhere, said Dr. Julie Watts McKee, the state dental director of the Kentucky Oral Health Program, a public initiative that carries out community programs to reduce oral disease. The cost to fluoridate water for a person’s entire lifetime is cheaper than the price of a single filling, McKee said. Elsewhere in the country, the percentage of residents receiving water varies, with Hawaii at the low end at 11.7 percent. It’s not always a health fear that keeps states from raising fluoridation levels; sometimes the decision is budgetary. Either way, the low levels are troubling to fluoridation proponents, who argue that it gives everyone a shot at fighting cavities — regardless of access to dental care. The effects of cavities, particularly untreated ones, can be far-reaching. 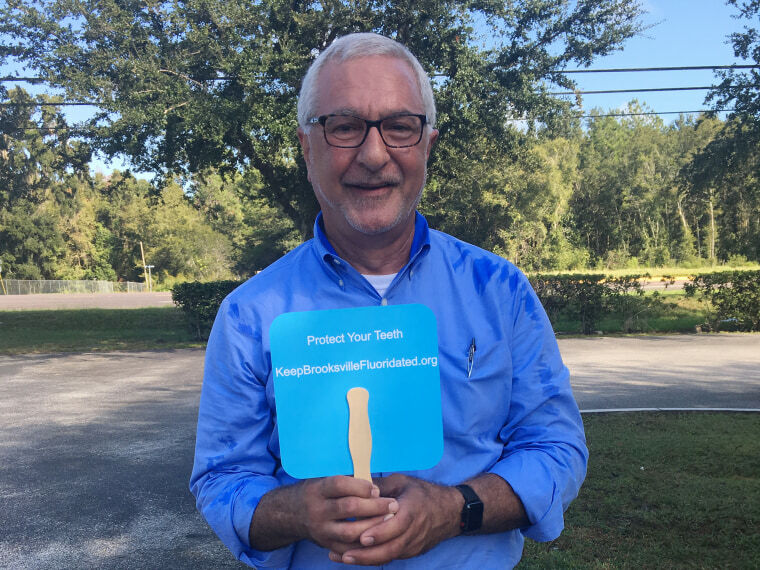 In Brooksville, Florida, where the vote on removing fluoride is just a couple weeks away, Mayor Erhard has high hopes that her townspeople will vote it out. The city has spent about $19,000 on fluoridation over the past five years, and she would like to see that money go someplace else — such as repairing the city’s roads. Erhard said she doesn’t worry about how kids will fare with nonfluoridated water, so long as parents do their part to encourage good oral health.